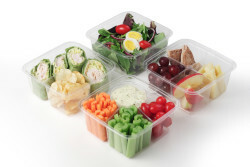 Compostable snack pack packaging – newly available! They can be used for school snack packs, catering companies or for food transformation companies for packaging vegetable and nuts for a grab and go point of sale environment. Call with any questions about the product to see if they will work for your packaging needs.